Half of the whales were euthanized, officials said. As many as 145 whales have died after a “heartbreaking” mass stranding on a remote island, the New Zealand Department of Conservation said on Monday. The whales were reported to the authorities Saturday evening by a hiker on Stewart Island, a remote island which lies off the country’s south coast. By the time rescuers arrived at the scene, around half of the stranded pilot whales had already died. The decision was taken to euthanize the surviving whales, the Department of Conservation said in a statement. (Department of Conservation via AP) Pilot whales at Mason Bay, Rakiura on Stewart Island, New Zealand, Nov. 25, 2018. “Sadly, the likelihood of being able to successfully re-float the remaining whales was extremely low,” said Department of Conservation Operations Manager Ren Leppens. Large numbers of pilot whales have been stranding for as long as we know. It seems to be a species that is particularly susceptible to these mass strandings of live animals. It’s still a bit of a mystery. “However, it’s always a heart-breaking decision to make,” he added. The mass beaching, also known as a "stranding," was one of a number of similar incidents in New Zealand over the weekend, which were unrelated, officials said. In the north of the country, a 49-foot-long sperm whale died on Doubtful Bay on Saturday. A rescue operation is also underway on the north island’s Ninety Mile Beach after ten pygmy killer whales were discovered on Sunday. Two of the animals have died, but the authorities launched an appeal on Facebook to encourage the public to help “re-float” the surviving eight whales on Tuesday morning. Cases of beached marine life are a relatively common occurrence on New Zealand’s coastlines. The Department of Conservation responds to an average of 85 strandings per year, officials said, but most of the time this only involves a single animal. The remote location, lack of nearby personnel and the whales’ deteriorating condition meant the most humane thing to do was to euthanize. Even so, mass strandings involving large numbers are not out of the ordinary for pilot whales. 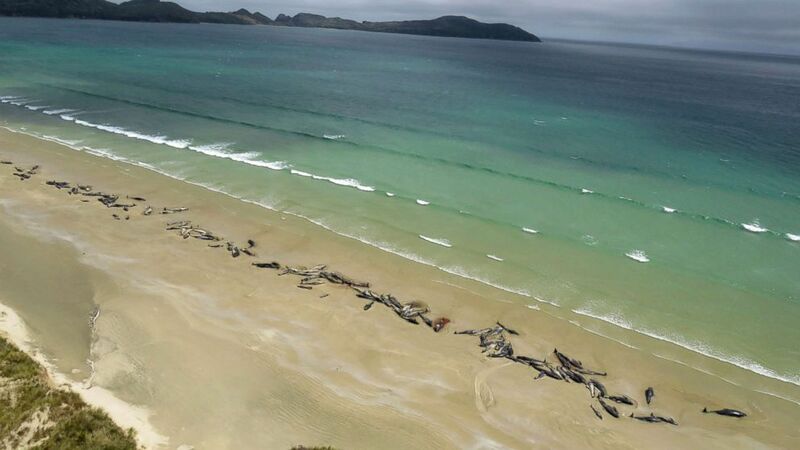 The largest recorded whale stranding in New Zealand’s history occurred on the Chatham Islands in 1918, when around 1,000 pilot whales came ashore, according to The Guardian. There are a number of factors that can cause whale strandings. These can include sickness, extreme weather or human interference in the oceans. But in this instance “we can’t attribute it directly to human activities,” Leaper said.